There are also some good wines and liqueurs made from local plants. Recently, many of the hotels on the Tour du Mont Blanc have begun to offer a greater choice and are trying to cater to people with specific diets. Hotels and restaurants are conscious that hikers need meals that will keep them going on the trail. As such, there tends to be a lot of potato and pasta. Most hotels provide a three-course meal with soup, main course and desert. Occasionally they will serve cheese. Vegetarians are fairly well catered for and the hotels are beginning to cater to gluten-free and vegan diets. However, you need to have a fair bit of flexibility as these have only recently been available and the hotels are still experimenting. Obviously, it is important to give your hotel advance warning of any specific diet. The region is known as the Haute Savoie and straddles this high mountain area of France and Switzerland. Once a traditional farming region, the food revolved around goats, cows, sheep and foraging for berries and mushrooms. Cheese fondue is perhaps the most famous dish which traditionally used old and often mouldy cheese that was heated up until melted. You then put stale bits of bread on a wooden stick and scoop up the cheese. This has to be eaten with plenty of white wine as water and beer tends to make the cheese congeal in your stomach. Thankfully, the white wine breaks in up! Tartiflette is popular and hearty: it is traditionally made with cheese, onions, reblochon cheese and lardons (bacon bits) and is served in a large frying pan. It tends to be quite creamy. There are other variations that use mushrooms. It is similar to the traditional Swiss mountain dish called Rösti which is made with grated potatoes that are pan-fried and fashioned into a fritter with local cheese and bacon and perhaps with a fried egg on top. 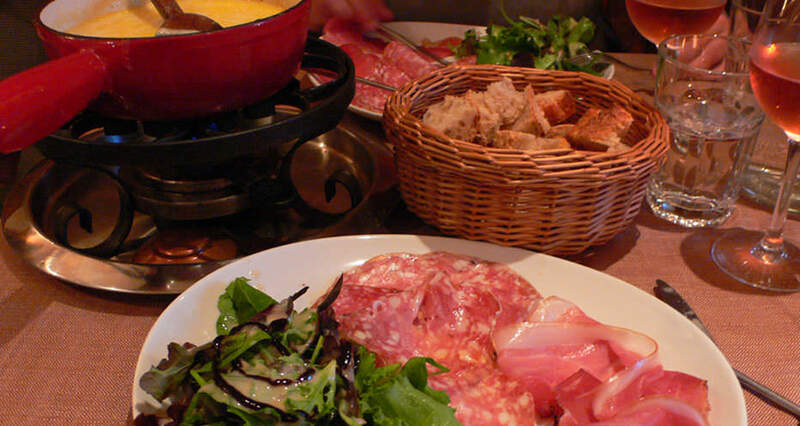 You can find both dishes in the mountain huts and restaurants in Chamonix. Bilberry tart or tarte aux myrtilles is found in some restaurant and mountain cafés. Made with a good pastry base, the wild bilberries are poached and then poured in to the pastry base with a bit of jelly to make it shine. Eaten with cream it is a fabulous mix of the sweetness of the cream and the sharpness of the berries. In early summer it is quite easy to find wild bilberries along the trail. You will find a wonderful array of ice cream in most towns and there are all sorts of berry-based flavours, sorbets and classics. Although the elevation of the Savoie region is a bit too high to make top notch wines, it does produce some reasonable reds and whites. Chignin Bergeron is the famous white wine made of the Roussanne grape and reds are made with Pinot Noir and Mondeuse grapes. All of them are worth trying and tend to go well with local dishes. In winter you can drink vin chaud – translated as hot wine. Not dissimilar to mulled wine, all regions have a slightly different twist on the drink. In the Savoie is tends to have nutmeg, cloves, cinnamon and honey and is gently warmed for a couple of hours until ready. Génépi is a famous digestif unique to the area. Made with pure grain alcohol, sugar and Artemesia (commonly called Wormwood) it is a sweet liqueur with a herbal flavour that often rounds off a good dinner. Each family has their own recipe, but as a rule of thumb, a litre of Génépi needs forty flowers, forty grams of sugar, forty percent alcohol and needs forty days to rest. It tends to be a honey colour, though can be green.